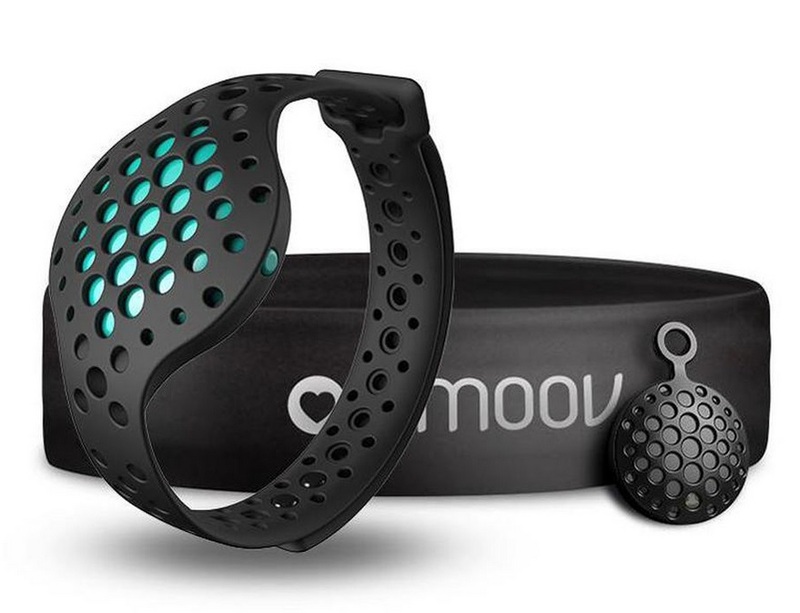 Moov Now, or the updated version of the previous Moov is a smart pebbles that tracks your workout while giving audio coaching for become more active athletes. With this live audio coaching feature, this device is perfect for beginner who doesn’t know how or where to start to working out. It will help them to run and cycle faster as well as swim more efficiently. More interestingly, you can even use two pebbles on both wrists to track your boxing, even if it means that you’ll need to double your cost to buy two devices. Unlike its predecessor that was aimed for being dedicated sport coaching only (boxing, running, swimming, and cycling), Moov Now has been equipped with activity tracking as well. It tracks sleep, counts burned calories, and record your daily active minutes. Moreover, this activity tracker also collects 3D motion data of the user, and giving an instant feedback in form of Audio Coaching from the Moov App. With all these functions, is this device also aimed for serious athletes or just for beginners? Let’s find out. There is significant difference in term of design between the original Moov and Moov Now. As stated in wearable review, the original Moov was very chunky with odd-looking watch-like. But fortunately, this original Moov dimension is cut on the new Moov now, making it sleeker than before. Not stopping on that, the design was upgraded too with pretty much lighter weight. As for the components, this tracker consist of two main components. First one is the main hardware, which is the round device in shape of coin. Even though it’s small, but this device consists of several sensors (gyroscope, magnometer, and accelerometer), Bluetooth modules, and battery. For the battery, instead of using rechargeable battery, Moov Now uses traditional watch battery (CR2032) which is claimed to last for six months. This main hardware is offered in 4 color variants; black, red, white, and blue. The second component is the strap, which is one of attractions of Moov Now. When securing the main hardware turns to be something difficult for some manufacturers such as Misfit, the strap of this new Moov works pretty well in securing the main hardware. This strap itself is made of comfortable and lightweight silicone, with a pouch in the middle of it to slip the main hardware in. This mechanism of strap and main hardware arrangement works very brilliantly, where it’s very rare case for the main hardware to fall. Plus, the strap design with small holes on it gives more aesthetic value to the tracker. The color shade looks very good between the strap and main hardware. There are several items are measured on the Moov App. Unlike other applications such as Strava that just measures distance, heart rate, and pace, the new Moov App also measure those things but with several other additions. First thing to notice is the addition score of impact. This means that the tracker calculates or measure how soft the run we’ve taken. It tells us how hard we hit the ground, and tells you if it’s too hard. The ideal score for this is 1-12 g’s, while 20 g’s is too hard so that it may harm your joints. Further, Moov Now also measure Motion range. In this measurement, the device identify legs angle when it’s swinging back and forward. When you have higher motion range score, your speed will increase, while lower motion range score will increase efficiency. Lastly, the tracker also measure cadence, or amount of steps taken per minute. Optimum score for cadence is between 160 to 190. Live Training is the highlight of Moov Now device. This feature uses voice command to give user virtual coaching. This virtual coach will help you run better or faster by telling you what to do. Cycling and running get highest intensity of coaching. On the other hand, for boxing and swimming, we only get recorder data in the apps. Moreover, Moov Now is also equipped with host training plans. There are various selections of running plans that presented in such manner that will not scare newbies runner. This feature is developed to achieve goals that have been set and use voice data to increase user’s performance. Answering earlier question, on whether this device is also suitable for serious athletes or not, here we say that it is not. It is because first, the tracker does not allow users to set their personal exercise goals, which obviously athletes need. The goals have been set all in the default plans, so we can only depend on the default goal. Secondly, the device is lack of GPS. Indeed, the device can sync the GPS data from the phone. But, to sync to the phone GPS means that you have to carry your smartphone everywhere, including when running. For some people, this mechanism is really disturbing because carrying smartphone can be so burdening. Besides, some people also think that it is a bit difficult to do synchronization between the smartphone and Moov Now device. However, this tracker is really good for beginners. It’s simple, and not really intimidating with all the features. Besides, the coaching feature will be very beneficial for correcting the moves and educating users about how to exercise correctly. The design of this activity tracker is also interesting. It’s futuristic and light weight. You can attach it everywhere without even feel the device. So, for you who just start to run and needs virtual coach that can coach you during the run, Moov Now will be the perfect device. As for the price, CNET review suggests that this fitness tracker is priced around $100.